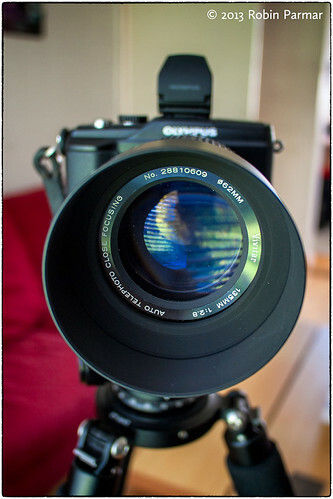 Back in 2010 I published two articles on 135mm focal length lenses. The first was an overview with a special focus on Pentax, since I was using that system extensively at the time. The second article went into more detail and recommended three specific models. As it turns out, there's been renewed interest in these articles lately, plus I've been discussing the same topic on a couple of forums. It struck me that I have never covered the very lens that turned out to be my favourite of the bunch. With spring flowers begging for photos, it's time to set that right! Read on for the scoop on the lens with the maximal moniker, the "Vivitar 135mm f/2.8 Auto Telephoto Close Focusing". First, a historical perspective, then I'll consider the physical aspect, making some judgements along the way. At that time Vivitar made some of the best off-brand lenses, competing with native lenses from Nikon, Canon, Pentax, and so on. When they introduced the prestige "Series 1" line, the prices were even higher than the main brands. The lenses from this time period are legendary today, though later Series 1 models suffered a significant dip in optical quality. Vivitar still markets lenses, but they are no longer exceptional. The "Series 1" range rather overshadows the regular line, even though it also contains some great optics. And so, in the range of 135mm lenses, it is the "Vivitar Series 1 135mm 1:2.3" that gets the attention. Indeed, this was the lens I discussed in previous articles. But I never got my hands on one, instead... yes, let us return to the glass under examination. But first, be sure not to confuse this lens with yet another possibility, the "Vivitar Auto Telephoto 135mm 1:2.8". 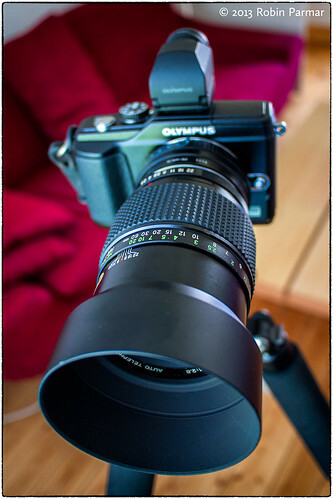 Besides the fact that this other lens doesn't say "Close Focusing" on the front rim, it specifies a 55mm filter. It's very common and inexpensive. As I write there are 11 examples on eBay, but not one copy of the lens under discussion. It's a good deal rarer. The build on the Vivitar 135/2.8 CF is solid with no wiggle, all metal and glass in a decisive tool. The rubber knurled focus area is wide and easy to use. The helicoid has a long throw. One full revolution of the focus ring takes us from infinity focus to 1:3 magnification, this number clearly marked on the barrel behind the grip. Another half-turn takes us to the maximum magnification of 1:2. This gives us lots of control in the near-macro range where we most need it. I should note a rather curious feature that is indicative of a sharp engineering mind behind the design. As usual the focus ring is marked in distance to subject, from infinity on down. But what happens once we have made our first revolution? The final marking says 0.75 meters (in green) after which we return to infinity. Yet we can focus still closer, the new distance indicators appearing on the barrel in front of the focus grip. Clever! The aperture ring starts at f/2.8 and has markings for f/4, f/5.6, f/8, f/11, f/16, and f/22. There are half-click steps between each of these indicators except for the last interval. I find that the ring turns almost too easily, but this might be handy for video work. 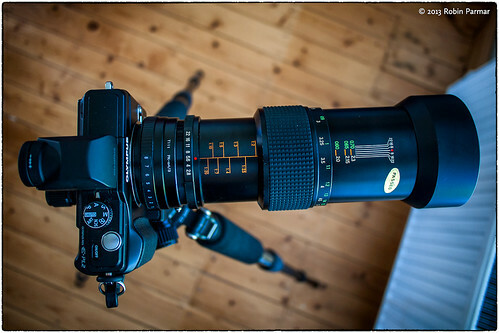 This is an "Auto Aperture" lens, a term I describe in my article on SLR Aperture Control Mechanisms. So there is no "A" marking on the aperture ring, but instead a switch to go from "M" to "A". On a camera like an Olympus PEN, which meters directly through the glass, this is a treat to use. Leave it in "M" and use the aperture ring. Simple. The lens was available in several mounts including Canon FD, Nikon AI, Minolta MD, Pentax K, and M42. The latter is what I obtained, mounting it to Pentax with a simple adapter. Now I have a second adapter to go from K-mount to Micro Four Thirds. The lens weighs 425g and is 86mm in length. Add the hood and it's 113mm. With the mount adapters it's 149mm. And fully extended, at maximum magnification, it is a rather daunting 217mm. Still, these figures are reasonable considering the alternatives. I've mentioned that the lens has an impressive maximum magnification of 1:2, which permits close focus at 59cm. Any contemporary manufacturer would call this a macro lens, but Vivitar insists on the correct definition of the term, which requires 1:1 magnification (meaning that the image on the sensor is the same size as the subject). Thus this lens is "Close Focusing" but not "Macro". Here's some perspective on what an engineering achievement this lens is. When compared to the Vivitar Series 1 135mm 1:2.3 VMC, it's is one-third lighter, has twice the magnification, and focuses 30cm closer. But does it deliver the goods? We'll see in part two. P.S. I have read that the same lens was sold as Maginon and Panagor brands, but have seen no evidence of this.